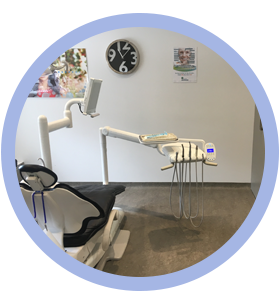 Different dentists will work on different days and, whilst all the dentists here are great, should you have a preference, you can always be booked in with the dentist of your choice. Should you have an emergency, we will make time to see you that day, though you may have to be patient while we squeeze you in. Our practice features two fully equipped operating surgeries and third consultation room. We are fully computerised and use the latest version of dental4windows. We follow strict sterilization procedures and use the latest materials and treatment methods to ensure you receive really good quality treatment. We use rotary endodontics for root canal and our preferred system is Protaper by Dentsply. Whilst Amalgam can still be useful in certain circumstances it is rarely used nowadays in private practice in Australia. We do keep it available should it be needed. Most fillings we do are placed with the current gold standard composite technology; Filtek Supreme. This is strong and can be highly polished making it both durable and aesthetic for fillings in your front and back teeth. All instruments are sterilised and packaged according to Australian Guidelines. We have nitrous oxide and oral sedation available for anxious patients though our dentists are particularly gentle and good at making you feel relaxed and at ease. We currently use standard X-rays in house and refer to Spectrum imaging; conveniently located next door for OPG’s and CT scans as required. Spectrum X-rays are bulk billed with your medicare card, saving you money. 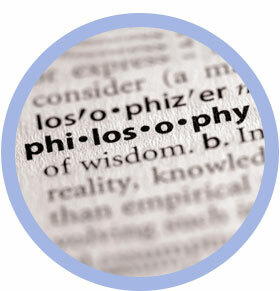 We stay on top of the latest products and technology through studying the literature and regularly attending courses. These are tried and tested and integrated in the practice if they prove to be more effective than what is currently used. Each surgery has room for a couple of family members to sit and watch or provide moral support for young or anxious patients. We decided to remove spittoons from the surgeries for hygiene reasons. When you are numb, the accuracy of your spitting can become a little questionable to say the least, we prefer to use disposable cups for rinsing that you can hold right under your chin when rinsing. We use latex gloves unless you inform us of an allergy in which case we use the nitrile, non latex version to avoid any adverse reactions. 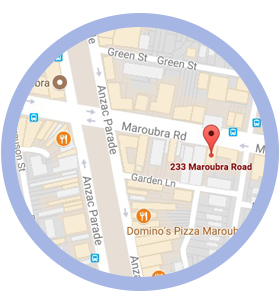 Our dental practice is located on Anzac Parade in the heart of Maroubra Junction. Parking is available in the central reservation for 2 hours, in the side streets of Boyce Road or Almar road or if you are struggling you may take advantage of the two hours free parking in the Pacific Square car park on the opposite side of the road. 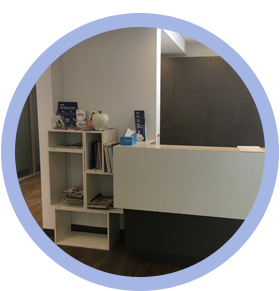 There are a number of dentists in Maroubra, though we would like to think they weren’t all created equal so look for our sign outside and walk up the stairs to the first level where you will see all our names on the door. We treat you as we ourselves would like to be treated; with the same choices, explanations, treatments and care and attention that we give our own family and friends. We are committed to making you happy and seeing us as little as necessary to maintain a healthy mouth and smile. We believe prevention is key to long term health and keeping costs down so are very active in this regard. We approach every individual with the same care and attention but appreciate you may have vastly different needs or wants and wishes,or even expectations. So we treat you in the way ‘you’ would prefer, offering our professional guidance and expertise in educating you in the decisions you need to make. All our dentists are passionate about continuing education and improving their skills with reading, seminars and courses. Often many choices of treatment exist; we will take the time to explain each of these to you, allow you time to ask any questions and never pressure you into any kind of decision. It is all about us working together to create a plan that is right for you. There is always a friendly, relaxed atmosphere about the practice to help you feel at ease. In a world of advertising and marketing, we realise that picking a dentist is not an easy decision- we hope we have helped you some-way towards making that decision. We are pleased to have had the pleasure of looking after many people who found themselves in your position and hope you too will choose to get to know us.